Thank you for visiting my site! Photography is something that I take very seriously, and so I offer quality services for reasonable prices. Please feel free to contact me with any inquiries or questions. Web proofs: If you plan to use photos for personal uses, such as email, facebook and other such sites, please purchase web proofs which are a slightly smaller image size with a non-obtrusive watermark. Not to be used commercially. Cost: $4 an image, with a minimum purchase of 3. Digital images are high resolution images that come with Print and Reproduction rights, and are available for $10 and image. No watermark. With the P&R rights, you can use the images externally for commercial uses and may reproduce them as many time as needed. 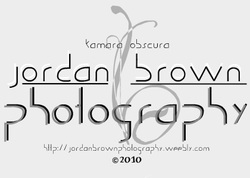 Please be sure to obtain written permission from the photographer (Jordan Brown) before publishing any digital images with a professional publishing company. "According to Canadian copyright law, the photographer (Jordan Brown) still maintains ownership rights over any purchased image(s) unless otherwise stated on photo release." ** larger prints can be arranged, for multiple prints a "bundle" price can be arranged. Photo shoots can be arranged, at a rate of $100 for an hour (or until we get the shots). This also includes a CD of all web proofs taken. Further digital images and prints can be purchased at a discounted rate. Removal of copyright or manipulation to copyrighted images is strictly prohibited unless prior permission is granted in writing from Jordan Brown. Photos are not permitted for use of commercial purposes unless P&R rights on the image(s) are purchased first.